California felt 110 earthquakes during 2013 in the 3.0-6.0 magnitude range. With the largest being only a 5.7, California is still waiting for another big one. WorkSafe Technologies of Northern California says goodbye to 2013 and hello to 2014. WorkSafe continues to be the premier "base isolation" solution provider for IT server locations in seismically active zones through installation of the patented Iso-Base™ seismically isolated platforms. With another year in the record books, WorkSafe looks back at the events that shook California. 2013 brought with it numerous natural disasters. Floods, hurricanes, tornadoes, and many earthquakes. Luckily California escaped virtually unscathed even though going through 110 earthquakes in the 3.0-6.0 magnitude range according to the European-Mediterranean Seismological Centre. The largest of which was a 5.7 located in Central California during the month of May. Even with all this activity, California still did not experience a "BIG ONE". What does this mean? It means that 2014 could be the year we see a significant event. It also means you still have time to prepare. WorkSafe Technologies of Northern California helped many companies, old and new, prepare during 2013. WorkSafe will keep this effort going by continuing to offer their non-structural seismic audit at no cost. This audit is a very useful tool in helping companies decide on what mission critical equipment to protect and how to better protect their employees from the hazards they face on a daily basis. Southern California hasn't had another major event the likes of the Fort Tejon earthquake in 1857 and is due any day — or decade — for something of a magnitude 7 or higher. Northern California is ready for one too. The Hayward Fault, which runs along the east side of the San Francisco Bay, averages a major earthquake once every 140 years. The last one occurred in 1868, over 140 years ago. 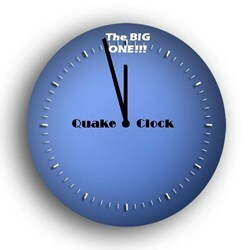 The U.S. Geological Survey (USGS) puts the odds of a magnitude 7 earthquake occurring within the next 30 years at 60%. Experts agree, it's not a matter of if, but when.